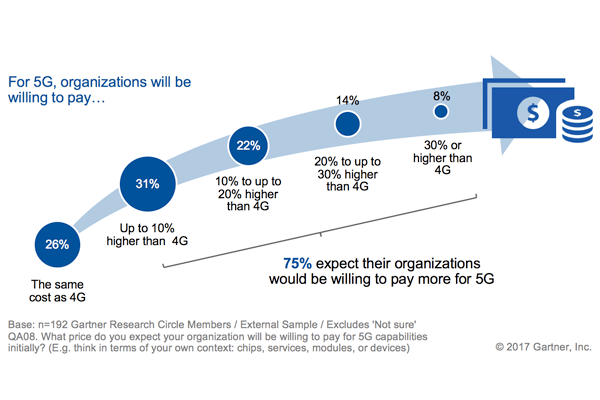 Egham, UK, August 9, 2017: A recent global Gartner survey* revealed that 75 percent of end-user organizations would be willing to pay more for 5G mobile capabilities (see Figure 1). Only 24 percent of the survey's respondents would be unwilling to pay more for 5G than for 4G. "Those in the telecom industry are more likely to be prepared to pay more than those in other industries," said Sylvain Fabre, research director at Gartner. "End-user organisations in the manufacturing, services and government sectors, for example, are less likely to be willing to pay a premium for 5G than telecom companies, which are willing to pay a 5G premium for their internal use." Additional analysis is available in the report: " User Confusion About5GDemands CSP Action ."